Birding247.co.uk - Birdwatching Reportage | Birdwatching Reviews | Birdwatching Travel | Birdwatching Advice. ​Birding24/7 is launching the Wall Of Fame Bird Photography Competition in January 2019. The competition is open to all UK residents, aged 18 years and above. 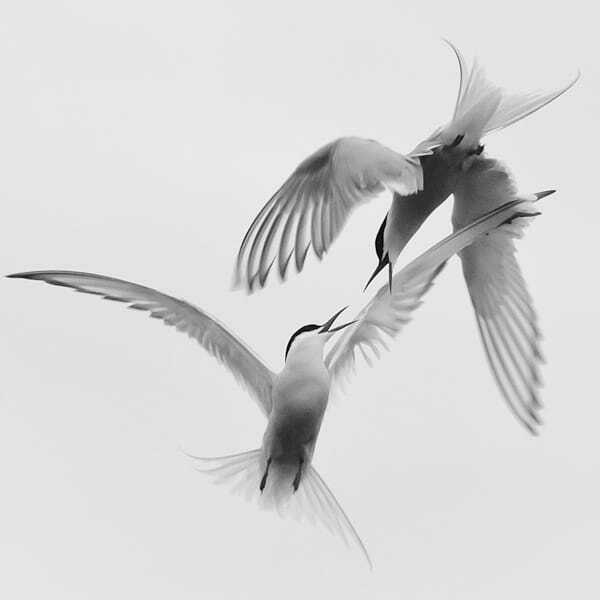 Entrants will submit images featuring birds in their natural habitats with the aim of encouraging others and inspiring amateur birders to engage with the natural world around them. 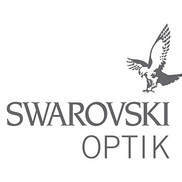 ​The winner will receive a brand new pair of SWAROVSKI OPTIK 8x32 EL Binoculars. ​Gitzo, the pioneer of some of the most advanced, revolutionary technologies for professional camera equipment, has built on the success of its Gimbal Fluid Head by introducing the new 2 Way Fluid Head - dedicated to birders and wildlife observers. The Gitzo 2 Way Fluid Head promises to provide the highest performance for birders and digiscopers using medium-sized spotting scopes, as well as for wildlife photographers and videographers using premium CSC or DSLR cameras with lenses up to 200mm. 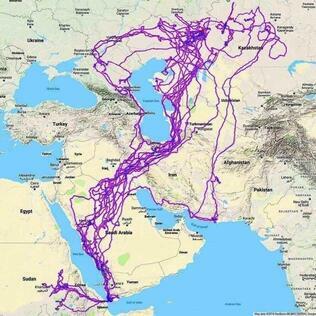 This map shows the movement of a Steppe eagle over a twenty year period. The bird had a tracker fitted in Russia and the solar device recorded right through to when the bird died twenty years later in the Valley of the Child in Saudi Arabia. It is fascinating to note just how far this eagle travelled over twenty years of life, crossing many countries in the process and avoiding crossing the sea, seemingly at all costs. A European storm petrel chick has been recorded calling on the Shiant Isles for the very first time. This is an important step for the Shiant Isles Recovery Project as it’s the first known breeding of these seabirds on the islands. Having completed its third year, Bird Photographer of the Year (BPOTY) has announced the 2018 winners of this prestigious global competition. The winning entry, an explosive image of American Flamingos titled ‘Black Friday’, taken by Pedro Jarque Krebs from Peru which scoops him the top prize of £5,000. Country Innovation, the Somerset based brand with a growing reputation for quality amongst birders and outdoor folk in general - has launched two brand new jackets ready for the autumn season in association with the RSPB... the Avocet and Lady Avocet. The brands driving force, Maria Chilvers, has been working on these jackets for the past couple of years and they are now on their way and will be launched at this year’s Birdfair 17 – 19 August. The study has already identified important migration routes via stopover sites in northern Italy and southern Spain, and the precise wintering locations in the Congo rainforest. Godwit eggs rescued from muddy farmland in East Anglia have hatched successfully. Conservationists, trying to protect the rare black-tailed godwit, teamed up with local farmers to save the eggs, which were found in poor condition after heavy spring downpours. Available to buy now, this scope may be small but it packs a big punch. Unseasonal April downpours forced tens of thousands of birds to nest away from the safety of the wetlands after their habitat in the Fens, East Anglia became submerged. Conservationists, trying to protect the rare black-tailed godwit, discovered clutches of their eggs on nearby farmland, trapped in mud, sparking fears over their future. Thankfully, farmers and conservationists were able to work together to help save the eggs. But, ‘Unring’ has finally found love with a new female osprey, which arrived over the bank holiday weekend. As spring has finally arrived, the RSPB is calling on wildlife fans who enjoy exploring the remote moorlands of the North East to look out for hen harriers, one of England’s rarest birds of prey. Spring has arrived along with the pitter patter of tiny feet at WWT Welney Wetland Centre, where the common crane has bred successfully for the first time. These scarce birds are shy and secretive during the breeding season, but to the delight of staff and visitors two chicks arrived on March 21. The baby birds are just six inches tall (15cm) when they hatch, and are quickly able to walk, swim and run. Over the next 10 weeks both the parent birds will protect these precious chicks from predation and teach them how to find the food they need to grow. SWAROVSKI OPTIK have released an updated version of their popular digiscoping adapter - the PA-i8. ​Used to attach SWAROVSKI OPTIK spotting scopes and bino's to your iPhone 8, instantly turning your smartphone device into a telephoto zoom lens and ideal for capturing responsive bird images and videos in the field. Steiner launch new Observer series Binoculars with 10 year warranty. ​Recently launched and now available in the UK, Steiner's new Observer range of binoculars have been designed to provide versatility - with the promise the new binoculars will match even the most testing situations under almost any condition. Quite something within a range costing little over 200 pounds. ​You get a choice of 2 full-sized models, each providing comfortable ergonomics for long-term observation. The Observer range should provide an ideal bag companion for general purpose birdwatching use and with a 10 years guarantee, be quite competitive.